In an interview with News Source at the U.S Embassy on Friday, Ambassador Perry Halloway said that based on recent figures, 60% of the persons who apply for a visitors visa in Guyana are successful with their application. The United States Embassy in Georgetown has been increasing the number of non-immigrant visas that are granted to Guyanese nationals. In an interview with News Source at the U.S Embassy on Friday, Ambassador Perry Holloway said that based on recent figures, 60% of the persons who apply for a visitors visa in Guyana are successful with their application. He said just a few years the figure stood at just under 40%. “The basic tenet of our visa law for tourist visa is that you have to convince the Consular official that you have a life that is sufficiently good here in Guyana that would compel you to return. So if the economic opportunities are limited and the work opportunities are limited, and people don’t own their own home or car and there is a whole host of factors and each case is evaluated on a case by case and individual basis, then they are going to be people who we are not going to be able to provide a visa to”, Ambassador Halloway pointed out. News Source understands that the return rate of persons who would have been issued visitors visa is very high and is believed to be well over 90%. The current application cost for a US non-immigrant (visitors) visa, stands at US$165. 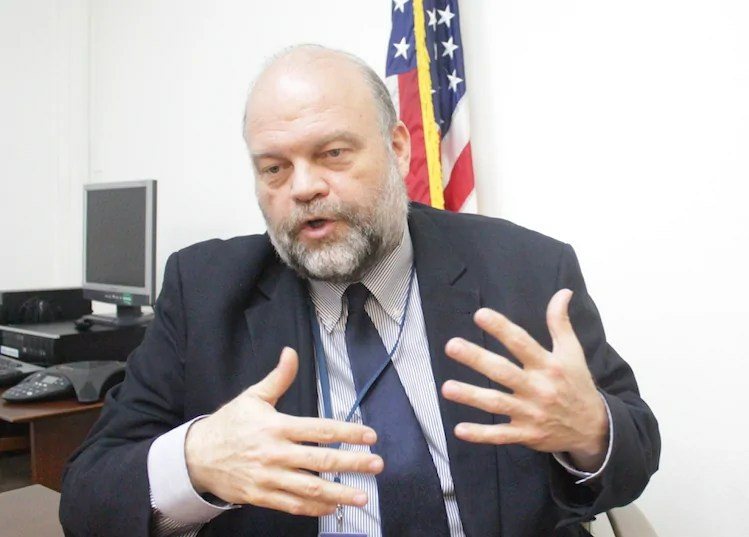 The U.S envoy said the number of successful visa applicants has been improving steadily and the Embassy has even noted a decline in immigrant (permanent) visa applications and petitions. He said he was surprised with the figures being on the decline. Mr. Holloway further explained that petitions/applications for immigrant visas peaked just after the 2005 flooding in Guyana but since that period, it has been on the decline. Ambassador Holloway said he is not sure why there is a decline in the number of persons seeking to migrate to the US permanently from Guyana, but that appears to be a good sign. He said in the case of student visas, although the applicants may have been able to prove that they have been accepted by a U.S college or university, they still need to prove that they will return to Guyana at the end of their studies. The local embassy through a number of initiatives has been encouraging Guyanese students to look to the US for their college education. The embassy event hosted a college fair recently in Guyana. The Embassy continues to invite locals to apply for their visas and visit the U.S as it remains open to tourism and business opportunities. LISTEN to interview with US Ambassador Perry Halloway on visa matters.